Les Coudoulets is located on the edge of the river Ardèche, 10km from the Ardèche gorges. 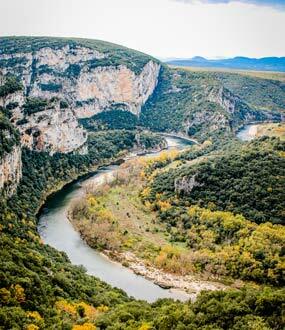 Here the river Ardèche flows through one of the most beautiful gorges in France. You can easily admire it by following the gorge road (the Route Panoramique) for around 30km between the Vallon Pont d’Arc and Saint Martin d’Ardèche. You can stop along the way to admire close up the famous Pont d’Arc, a natural arch over 60m high spanning the river Ardèche, 4km from Vallon Pont d’Arc. But it is of course in canoes or kayaks that you get the best experience of the river. With 25 rapids, descending the Ardèche gorges is an unmissable experience. More experienced people can cover the 32km in around 7 hours. But you can also go on a 2- or 3-day trip and spend the night in a bivouac at Gaud or Gournier. 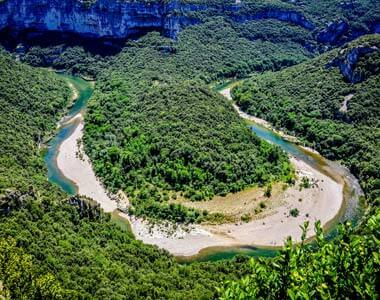 Various hiking trails cross the Ardèche gorges, allowing you to pass various fords to reach Saint Martin d’Ardèche. The Ardèche gorges are classified as a nature reserve. Their cliff faces, caves and heathlands are home to a great variety of flora and fauna. Various protected species such as Bonelli’s Eagle and Eurasian beaver have found refuge there.